So, first I have to say, I love this card. I cannot tell you that making 14 of these didn't bother me, but I love these! I did add alittle sparkle to the holly berry with some rhinestones, unfortunately it was after the photo was taken. I searched thru all my stamps for something simple... a simple holly berry.. can you believe I didn't have one.. but I did have one attached to a greeting- so I had to delicately use marker to only color on the holly, and then stamp it.. alittle more time consuming, but I like it. I like it enough that I am sending a handful of these to my fiancee to send out to his family and friends. (they cannot be all glittery, so why not just simple- right?) Now some of you might ask why I don't send them for him... well, he WANTS to do it, so I have prepared everything for his convenience. 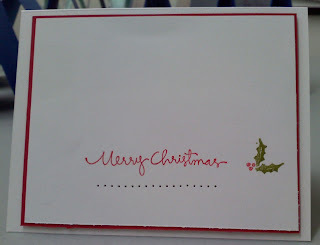 Such as addressing the envelope, and adding the return address, so he can sign the card, add whatever he wants to the card, and then put in envelope and ship back.. its more personal that way.. afterall, I couldn't have him sign blank cards when he was home for 5 days (though the thought crossed my mind!!!).. or could I?? It was preparing the inside that drove me nuts. I didn't have a sentiment for the inside that continued such clean and simple lines. Adding another holly on the middle was ok but not the look I wanted. Even the "Happy Hollydays" just didn't do it for me. So on the version I sent him I used the other greetings in this Christmas Greetings set, and for my own - I am searching for a middle verse.. any suggestions would be appreciated!